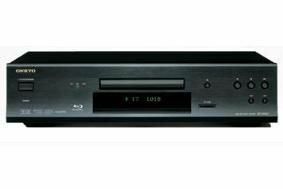 Onkyo launches its first THX-certified Blu-ray system | What Hi-Fi? The set-up consists of the BD-SP807 Blu-ray player, PR-SC5507 AV network controller and the PA-MC5500 nine-channel power amp. All three components have been tested and approved by THX. Starting with the Blu-ray player, it's Profile 2.0, equipped with a 297Mhz/12-bit video DAC from Analog Devices (ADV7340), 1080p upscaling, 192kHz/24-bit audio DACs for all channels and bitstream output of Dolby TrueHD and DTS-HD Master Audio soundtracks via HDMI. An SD card slot on the fascia allows viewing of downloaded movies, music and stills. Partnering the BD-SP807 is the 26Kg PA-MC5500 power amplifier. Its nine channels deliver 220W into 6 ohms and Onkyo claims its decision to use analogue rather than digital amplification "achieves a full-bodied and musical sound quality". Balanced and non-balanced connections are provided via gold-plated XLRs and brass RCA sockets respectively. The PA-MC5500 uses Onkyo's proprietary WRAT (Wide Range Amplifier Technology), a basket of technologies designed to deliver "high-fidelity cinema sound". Controlling all this power is the PR-SC5507 AV network controller, with high-definition audio and video processing. An HQV Reon-VX chip provides upscaling of all sources to 1080p over HDMI, as well as analogue component video upscaling to 1080i. There are seven HDMI, three component video and six S-Video/composite inputs, as well as two HDMI outputs and a USB input. The PR-SC5507 network controller is available now for £1800, the Blu-ray player and PA-MC5500 power amp will follow in February and March respectively. Prices to be confirmed.